I have been a practising sculptor for seven years. The form my work takes reflects my interest in the relationship between objects, people and the space they inhabit. I like to create sculptures whose form and scale cause the viewer to feel more aware of themselves and their connection to the work within the space, by the aggressive, though compelling, nature of the work. 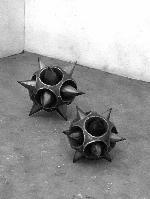 My sculptures are made from multiples of shapes. These shapes are completely three-dimensional to the extent that individually they seem to exist independently from the maker, but together they gain weight and presence. In March 1995 I exhibited in one of the Alternative Arts Galleries in Marylebone High Street. 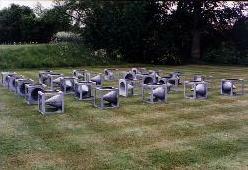 In Summer 1995 I was part of a sculpture exhibition in the garden of Feeringbury Manor, Essex. I also have work in the ongoing "Art Aid" exhibition at 77 Cornhill, London EC3. As well as making work for exhibition I am also interested in work for commission, both public and private.